The images of this old coin are present on Romanian coins thanks to Mr Janos Csorik. The coin is described at number 217 in the Moushmov catalog. 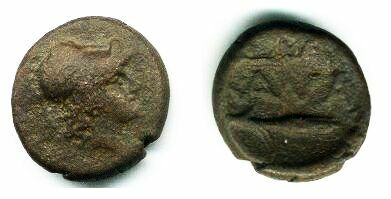 Another similar coin is described in AMNG I, at number 234 (possibly also number 235 or 239; AMNG = Die antiken Münzen Nord-Griechenlands, B. Pick, 1898).